The drought and shortage of potable water issue has been affecting the whole world for many years. A lot of countries, such as China, South Africa, Egypt, India, Saudi Arabia, UAE, Singapore, etc, have turned their sight to the vastest resource of water on the earth – seawater. Seawater desalination is the process of separating general potable water from the briny seawater. According to the International Desalination Association, there were 18426 desalination plants worldwide by 2015, which produced water of 86.8 million cubic meters (22.9 billion US gallons) per day, slaking the thirst of nearly 100 million people. At present, there are two basic technology categories for seawater desalination: membrane/ reverse osmosis, and thermal distillation or evaporation. In membrane/ reverse osmosis process, the seawater, at a high pressure, is forced through a salt-excluding membrane in the opposite direction (naturally the water will flow from the dilute solution to the high concentrated solution) to obtain drinking water. The function of thermal distillation is also simple – the seawater is evaporated from one spot and is condensed in another, leaving salt and impurities behind. 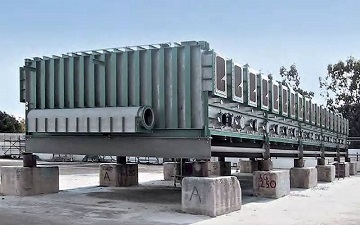 The multi-stage flash (MSF) evaporation equipment for a seawater desalination plant in Sharjah, UAE. Multi-Effect Distillation(MED): The MED takes place in a series of evaporator vessels (effects) each operation at a slightly lower ambient pressure than the previous. Since water boils at lower temperatures as the pressure decreases, the water vapor of the first effect serves as a heating medium for the second effect, and so on. Additional heat after the first effect is not required. Multi-Stage Flash(MSF): In the MSF processes, the feed seawater is heated in a brine heater in which heating is performed by condensing steam that passes through the vessel. The heated seawater, under higher pressure, then flows into another vessel(a stage) where the ambient pressure is comparatively low to cause an immediate phase change of a portion of the seawater, almost exploding or flashing into steam. A series of subsequent stages can be used to convert more remaining waters to vapor by this “flashing” process without adding more heat. The steam/ vapor generated by flashing is eventually converted to fresh water by condensing mechanism. Vapor Compression(VC): In the VC process, the heat generated by compression of vapor will power the evaporation of seawater. The function is based on a principle of reducing the boiling point temperature by reducing the pressure. 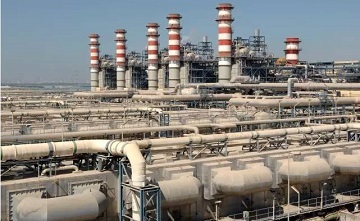 The Ras Al Khair desalination plant in Saudi Arabia. Its multi-stage flash evaporation (MSF) section is constructed with 100% titanium tubes. The corrosion resistance of titanium is resulting from a tenacious surface oxide composed of titanium oxide. Commercially pure titanium, Grade 1, Grade 2, Grade 3, exhibits excellent corrosion resistance to seawater at temperatures less than 130°C. In order to improve the crevice-corrosion resistance at higher temperatures, the modified titanium-palladium alloys are usually utilized covering Grade 7, Grade 11, Grade 16 and Grade 17. Another titanium alloy Ti-0.3Mo-0.8Ni is also often used. The titanium and its alloys have good resistance to pitting corrosion, hydrogen damage as well as erosion in seawater environment. Titanium finds its most applications in the thermal distillation of seawater, used for tubing, valves, heat exchangers, evaporators, condensers and other vessels, etc. Although the initial cost of titanium desalination equipment is higher than those of duplex stainless steel or copper alloy, the maintenance cost is comparatively much lower since titanium has the 40-year history in use without replacement according to engineering practice.